Polish perfectly with Griot's orange foam pad. When it come to machine polishing, Griot's Garage 6 Inch Orange Polishing Pad is built for speed. The dense orange foam keeps polishes on top of the foam to reduce waste. Get the shine you want faster with Griot's Garage 6 Inch Orange Polishing Pad and a 6 inch orbital polisher. The 6" diameter Orange Foam Polishing Pad combined with Griot's Garage Orbital Machine System puts down a thin, even coat of polish in a fraction of the time it would take to polish by hand. The speed and consistency of motion helps eliminate some imperfections more successfully than hand polishing. The Griot's Garage 6 Inch Orange Polishing Pad is made of a dense foam composition with tighter pores. That means that less polish is absorbed by the pad, so more polish is applied to the paint where it belongs. Griot's Garage 6 Inch Orange Polishing Pad has a flat face to provide excellent surface contact with the vehicle. The rounded edges allow you to approach edges and curves without worry of hitting them with a sharp foam edge. The Griot's Garage 6 Inch Orange Polishing Pad fits any 6 inch dual action or orbital polisher with a 5 or 6 inch hook and loop backing plate. 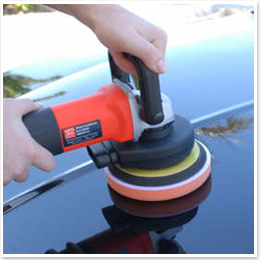 Griot's Garage 6 Inch Orange Polishing Pad is perfect for polishing and swirl removal. The Griot's Garage 6 Inch Orange Polishing Pad is washable and reusable. Wash it in a solution of DP Polishing Pad Rejuvenator and water. Allow it to soak for up to 15 minutes and rinse. Dry flat with the backing facing up. Store clean foam pads in a storage bin or plastic bags to keep them clean between uses. When used with Griot's Garage Machine Polishes, your results will be phenomenal. Use this method once and you'll be addicted for life. The firm Orange Pad allows for safe, easy polish application with professional results.